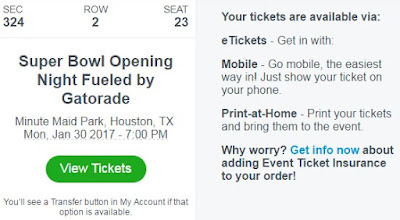 With Super Bowl 51 taking place very close to my current residence, I feel it's time to begin considering what in Houston I should participate in as the game draws near. I've also began giving thought to a theme I want my celebrations to consist of during those two weeks. "Fans are invited to watch media from all over the world interview the Super Bowl players. In addition, the event will feature live musical performances from premiere talent, special appearances and autographs by NFL Legends, cheerleaders and team mascots and a Red Carpet fan photo opportunity." 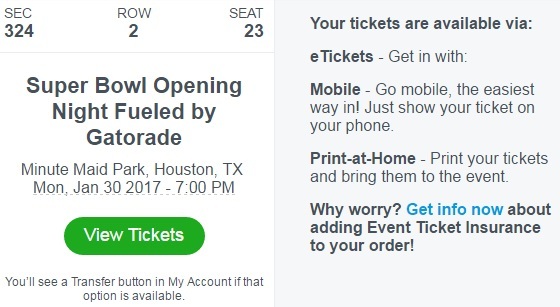 I purchased my ticket today from Ticketmaster. Sounds like a potentially important event for which I might need to obtain some new officially licensed NFL gear. I've learned you need to always dress properly for these types of events. In determining my theme, I decided to thank the NFL for a huge decision that came to pass this year. That theme is the return of an NFL franchise to the second largest market in the United States, clearly a huge step for the league and those of us who occasionally like to enjoy a game. Ladies and gentleman, after way too many years, the Los Angeles Rams are again blessing the city of Los Angeles, California, with contests in the L.A. Coliseum. And don't forget about that big, beautiful new stadium that workers are diligently putting together in Inglewood (always up to so much good), scheduled to open in 2019. I'll not only tweet information about my activities, but also retweet select content from the Rams organization to highlight what they have going on during those weeks leading up to the game. I simply enjoy honoring reputable organizations online, and look forward to seeing what the Rams' folks have planned in that city during those exciting weeks. I don't have to call this The Big Game. I'm allowed to use the term "Super Bowl" on this blog because that's what that game is really called. And Super Bowl 51 takes place down the road this year. I'll see y'all around town.